Thunder, lightning and torrential rain washed out second practice at the U.S. Formula One Grand Prix on Friday after Nico Rosberg went fastest for Mercedes in a largely meaningless morning session. Rosberg's championship-leading teammate Lewis Hamilton, who can seal his third world title on Sunday at the Circuit of the Americas, did only four timed laps in total and was fifth overall. After delaying the start of the afternoon session indefinitely, with marshals unable to work due to the risk from lightning and the medical helicopter grounded, organisers called it a day. Those hardy spectators who stayed on had been urged already to seek shelter in their cars. Formula One drivers are used to competing in the rain, unlike their counterparts in US oval racing, but the track was simply undriveable on Friday with the drainage struggling to cope with the deluge. 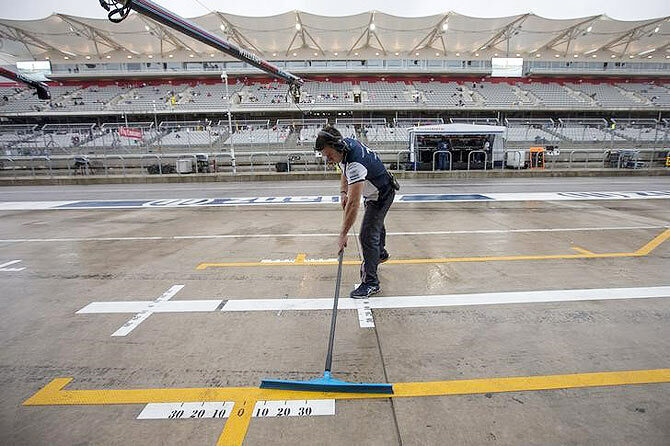 The forecast for Saturday, when qualifying is scheduled, was of more heavy rainfall in the Austin area. Further south, Mexico, which hosts the championship next weekend, is braced for the arrival of one of the most powerful storms in history with Hurricane Patricia heading towards the PacificCoast. "I hope tomorrow's better but the forecast doesn't look any good," Ferrari's Sebastian Vettel said as the rain lashed down. "It's a shame for the people in the grandstands." Rosberg was more than a second faster than anyone else in what turned out to be the day's only session, the German's best time of one minute 53.989 seconds comparing to the next quickest of 1:55.224 set by Russian Daniil Kvyat for Red Bull. Red Bull's Australian Daniel Ricciardo was third and Toro Rosso's Carlos Sainz fourth. Hamilton needs to beat Vettel, who has a 10 place grid penalty for Sunday's race due to an engine change, by nine points and Rosberg by two to retain his title. 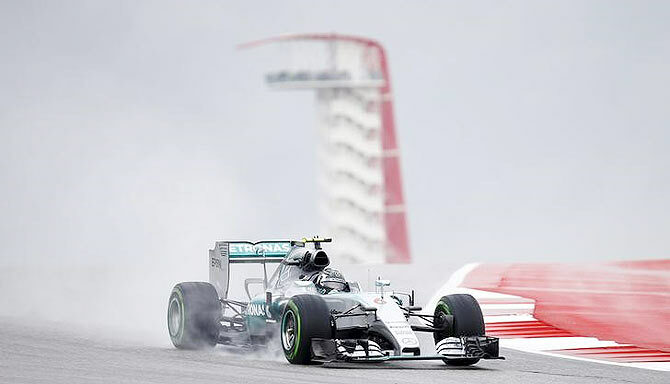 A Mercedes one-two, with Hamilton first, would do the trick and the Briton has a great record in Austin with two wins in the last three races there. Finland's Valtteri Bottas gave his pit crew a scare, forcing some mechanics to jump out of the way when he came in and skidded to a halt. "Sorry for that," he said as he departed. Vettel was sixth fastest, with Toro Rosso's Max Verstappen seventh and Ferrari's Kimi Raikkonen eighth. Manor Marussia's Alexander Rossi, who will be the first American to compete in a U.S. Grand Prix since 2007, was 18th of the 20 drivers.